Recently on facebook, I found myself taking a vocabulary test. Mixed emotions in play: enjoying being able to access FB at all; nervous as at any test (what is at risk, but pride? ), curious at the form of any such test. We distinguish between words we read comfortably, or hear without questioning them—received words, receptive vocabulary—and words which we will speak or write – productive vocabulary. Personally I recognise that the oral and aural vocabularies are significantly smaller than the written ones. In context, words I don’t know well enough to use productively are absorbed with ease. That is not to say one remembers them, of course. When I do a crossword, the result often includes words or names I (this one) didn’t know; this week, Phaedra and raceme; from two weeks ago, houyhnhnm (! ), imbedded (not embedded), morel (not moral), natant (should have got that, floating). And I was only doing / attempting the Guardian. I think my vocabulary is around 30,000 words. One test, http://my.vocabularysize.com/, says 28,800, where I thought perhaps three of my answers to the 100 words were dubious. Jebdu, http://www.jebdu.com/vocab.html said I was in the 96th percentile, over 37,000 with no errors, and said it again with two errors. http://testyourvocab.com said 40,100 [cenacle? sparge, clerisy, epigone? Am I sure about conflate? prurient, sedulous, captious, adumbrate ? [yes to all but the last]. Clerisy and cenacle I didn’t know and should. 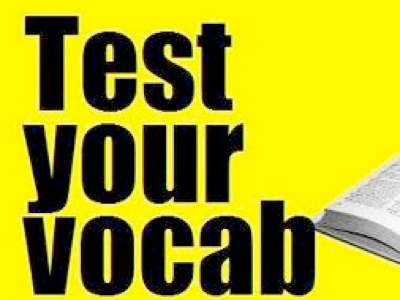 ‘Test your vocab’ is an excellent site and explains what it does, how it does it and shares the statistical results. Cromulent was a fonqa until it got popular, now it's in all the dictionaries. There is a wonderful resource, the British National Corpus, about 108 words. This has word frequency, an important feature. Subtract derivations (-ly), inflected forms (-s, -ed), place names, people’s names, gibberish. Adjust the frequency count to reflect those changes. Rank by frequency. This leaves about 45,000 words, surprisingly. It turns out that the rest of the dictionary is mainly either scientific or archaic terms, or rare but easy put-together words like "unrivaled." And the non-put-together words above 35,000 or so are, let us tell you, hard. Having got the ranking, the question set is then chosen in ways that remove deducible words, combination words (phrases), cognates and words limited by nation [canny, I thought, outwith the dictionary]. Then the (logarithmic) scale is set and with the now further limited set of words, each word you don’t ‘know’ is balanced by later words you do know. The position of balance fore and aft is where your vocabulary is deemed to lie. Clearly it is far easier to test receptive vocabulary than productive vocabulary. Clearly your vocabulary may include a load of words specialised to your business (or not) - these are left out, which will reduce the rating for medics, perhaps unfairly. Determinants of vocabulary depend, it seems, most upon reading habits “between 4 and 15”, or in my mind, up to 15. Factoids from the same site ../blog tell me: we learn about a word a day, but 2.5 times that if foreign; that foreigners will have a vocabulary over 10,000 if living abroad (ie in an English speaking country they match an eight-year-old native); that kids who read ‘lots’ pick up four new words a day. Since I’m in my second childhood, allegedly, today’s four words are curmudgeon, clerisy, cortinate and cortile but not curtilage, cortège, cortina or cortisol. 1 Now there’s an wicked idea: read more, live longer. For reading lots enlarges your vocabulary, and reading fiction more so than non-fiction (surprise; could that be because the technical words are generally missing from the test?). What really happens is that the data gets ‘noisy’. You know you're getting old when you have to look up the meaning of a word on urban dictionary. A road game similar to punchbuggy, based on the Scions. Upon the sighting of a Scion, one must yell the mispronounced "scoin" and purple nurple someone else in the car. Calling a White Scoin arms you with 2 nurples.